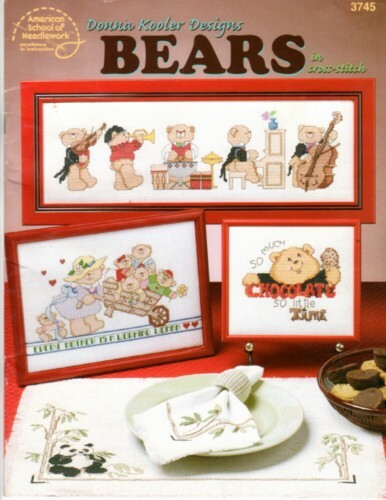 American School of Needlework Donna Kooler Designs Bear in Cross Stitch Counted Cross Stitch Pattern booklet. So Much Chocolate, Cocoa, Every Mother is a Working Woman, I Don't Do Mornings, Hugs and Kisses, Beartoven and Schubeart, Big Bear Band, Panda Picnic Table Linens, Panda Party, Huggy Bear, Bearing Gifts, Christmas Stocking, Sled Full of Gifts, Snow Friends, Beary Merry Christmas, Reindeer Ride, Honey Bear, Trimming the Tree, Heart Balloon Bear. This booklet appears to be in new to like-new condition.